Love them! A coworker of mine has a kitchen filled with mini-things. She especially loves the pseudo-anthropomorphic ones with hands and feet. She'd adore these. 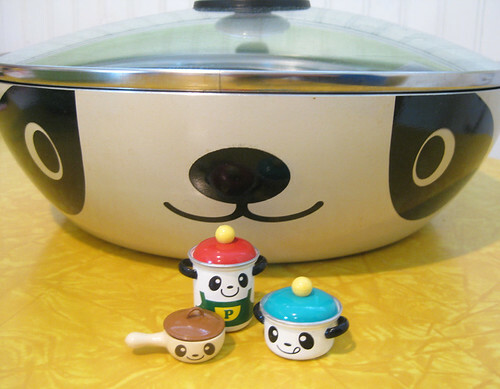 Cutest pots and pans ever! My 4.5 year old son is sitting here saying he wants them for his birthday! Can't blame him really. These are the cutest one's I have seen so far! Love them!!! I have never seen these before! They are so cute! Wow! 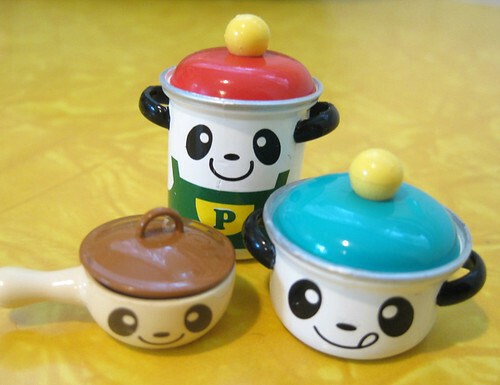 My love of pandas and small things in one *sigh* They are adorable! Oh My! Where did you find these? Absolutely adorable!!! thanks all! I love my pandas, real and mini. The minis are from a Re-Ment set, I actually bought the full set on ebay to get them all. The big pan came from Fred Flare. I don't think they have them anymore though! It's from Japan and probably still being made there....I want more of them! i guess that its "panda moniun"